Why did God make Grandmother’s? Laura Lynn Tyler Thompson, a friend and ambassador of cbm travelled with us on a trip – back to where she grew up – to Uganda. I wanted to share this blog with you because I feel she’s captured the vital role that grandmother’s play in Uganda, one of the world’s poorest developing countries. Enjoy the read! At the end of a life filled with wisdom that was formed in the darkest of storms and highest of heights, Grandmas receive the gift of giving it all away to the offspring who carry their legacy forward long after they are gone. The empathy and love that Grandmas have garnered through both the tragedies and triumphs of the journey are now imparted through their words, their kindness, their patience and laughter to the precious little ones who gather at their feet. 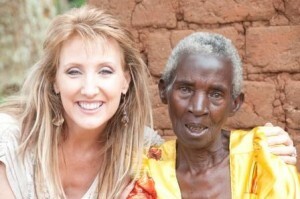 In Uganda, the reverence and respect paid to the elderly is a beautiful experience to behold. Many Grandmothers are left to care for the grandkids after a painful loss of their own children through AIDS or sickness. Without thinking of themselves for a moment, they take up the charge and responsibility unselfishly to raise the grandchildren. Setting aside their own personal dreams or desires, they work tirelessly to invest in a new generation. It may seem unfair to many of us in our culture, but the joy is seen in the Ugandan Grandmother’s eyes as they know they have a reward waiting for them in eternity and when they see their grandchildren gaining opportunities they may never have had, they are blessed to impart their powerful, selfless gift of love. A Toilet can be a Gateway to a Future for a Child! Please enter you email to subscribe to this blog. What does it mean to value all people as Jesus does? OLGA REGEHR on Who are left out of the Millennium Development Goals?